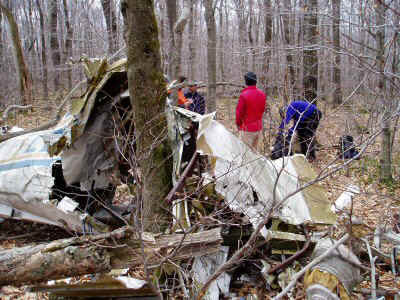 When I heard Ted was planning to explore the area around Van Wyck, with the aim of visiting two plane crash sites, I could not resist joining him, even though it was not an especially convenient weekend for me. We were joined by another hiker, Bob. It was a warm spring day, perfect for hiking. After a brief car shuttle, we got started hiking up the ridge. 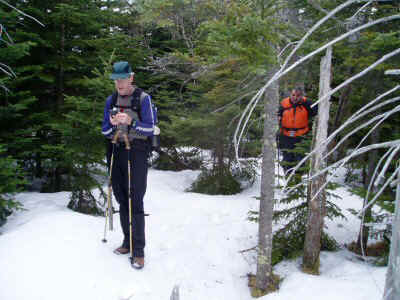 Both Bob and Ted had brought GPS receivers, which worked pretty well in the absence of leaves on the trees. Of course, they work best when you know the GPS coordinates of what you are looking for, which we did not. Ted had visited the lower crash site years earlier, and thought he could find it again, but it turned out that we did not climb to the ridge soon enough, and once we realized that we were above it, no one wanted to go back down. We did see many signs of previous civilization, now deep in the woods -- stone walls, foundations, isolated segments of backcountry roads. Apparently this land was more intensively used in times past. We hiked along the ridge, looking for the upper crash site. 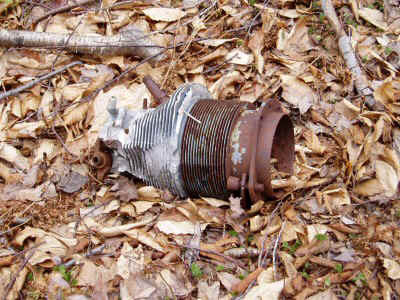 The aircraft was a single engine aircraft, which crashed directly on the top of the ridge. A few feet higher, and the plane would have cleared the ridge. 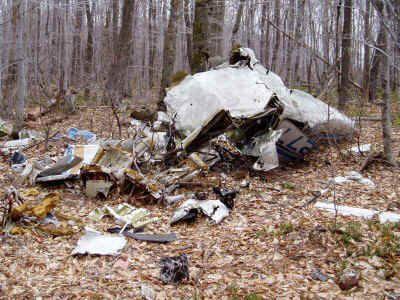 There was a small plaque on a nearby tree, listing the date of the crash and the names of the people killed. 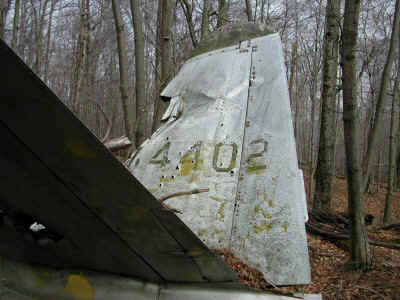 It was very eerie, looking at the seats, the controls, and the parts of the aircraft that were relatively intact. Then there were the hundreds of smaller parts, scattered all around. This is typical of the smaller parts scattered over an area of 100 feet..
A big piece of the craft wrapped itself around a tree. While we were exploring the site, we met another party coming up the ridge. They were moving much more quickly, and disappeared ahead of us in short order. 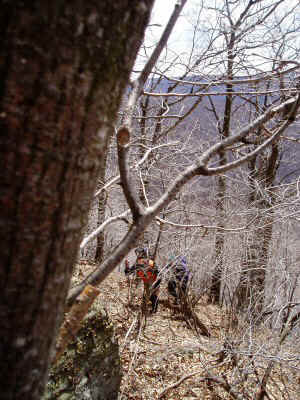 Beyond the crash site, the ridge becomes much steeper, as it heads up toward Van Wyck. After climbing to the top of van Wyck we headed toward Table. We skirted around the south slopes, rather than climb to the top. There was a foot or two of snow on the steep south side of Table Mountain. We contoured over and joined the trail just above the saddle between Table and Peekamoose. After crossing the summit of Peekamoose, we decided that rather than descending via the trail, we would go back via the "old trail." This branches off near the viewpoint, and descends steeply at first. We were able to find intermittent signs of ancient trail markers along the way. 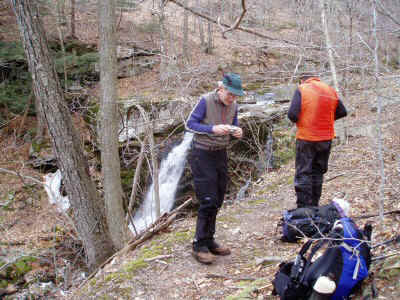 Eventually we joined Buttermilk Falls Brook, where we had to deal with swampy conditions and nettles. 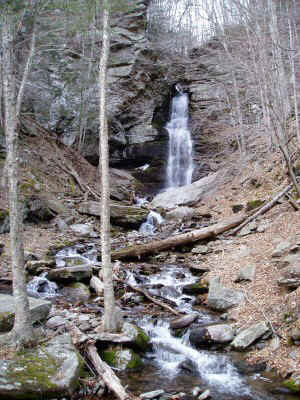 I especially enjoyed the last section, beside Buttermilk Falls. The next day, Ted tried again to find the lower crash site. This time he succeeded, and recorded the coordinates: N 41 55.649 W074 26.375. He sent me these photos. 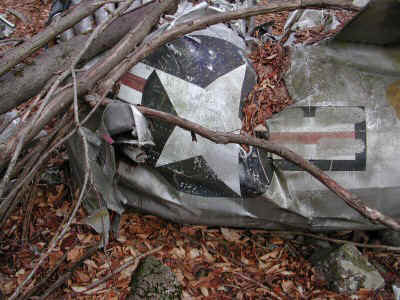 The lower crash is a Korean War era jet. 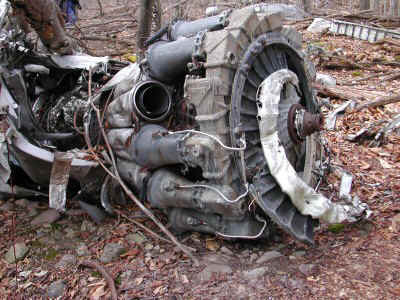 This is a piece of the jet engine.